Low-cost Malaysian airline AirAsia just launched its new Windows 10 Universal app. Since the app is a Universal one, users can install and use it on both Windows 10 and Windows 10 Mobile. The AirAsia app was already available in the Store before this new release, but it was built for Windows Phone and therefore wasn’t Universal. But, just like many large (and smaller) companies and developers, AirAsia migrated its app to the UWP to follow current Windows 10 trends. With AirAsia’s Windows 10 app, you can book cheap flights to more than 100 destinations in 22 countries. The app also allows you to search for flights and easily check in. Just like the majority of newly developed Windows 10 apps, AirAsia supports Cortana, so you can use Microsoft’s virtual assistant to book your flight even faster. Unfortunately, there aren’t many official apps of big international airlines in the Windows Store, and even some services like SkyScanner pulled their apps from the Store for now. But we hope international airlines will re-consider developing Windows 10 apps once again because Microsoft invests lots of time and money in making the Windows Store a respectable app marketplace. Tell us what do you think about the introduction of AirAsia for Windows 10 and which airline’s app you would like to see next in the Windows Store in the comments below. 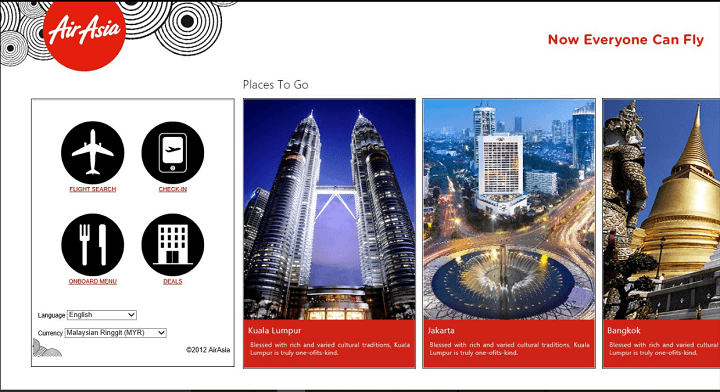 You can download AirAsia Windows 10 app and start booking your flights right now for free from the Windows Store.